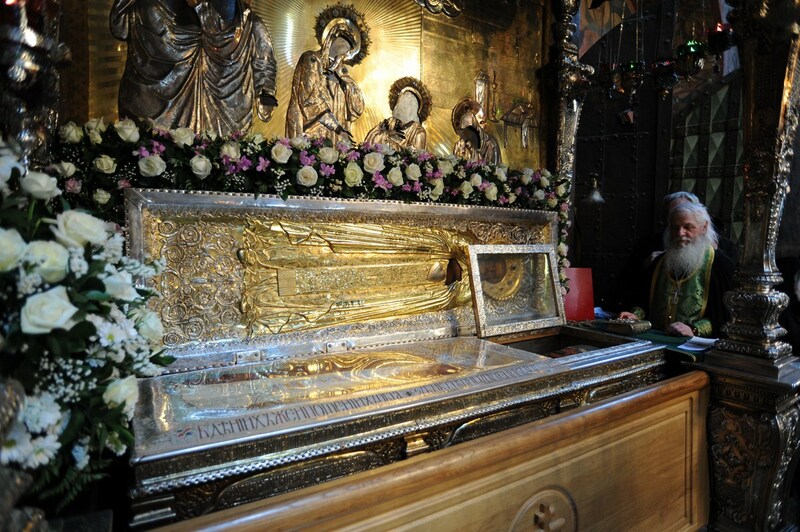 Question: "What is the basis for venerating the relics of saints?" 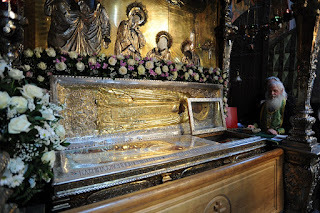 The veneration of the relics of the saints is rooted in several Biblical truths, as well as in the Tradition of the Church. "And God saw every thing that he had made, and, behold, it was very good." Consequently, we believe that God can and does use material things to impart grace, as is seen throughout both the Old and New Testaments. 2). God honors those who honor him. "for them that honor me I will honor, and they that despise me shall be lightly esteemed" (1 Samuel 2:30). "if any man serve me, him will my Father honor" (John 12:26). "Wondrous is God in His saints; the God of Israel, He will give power and strength unto His people. Blessed is God" (Psalm 67:35 LXX). 3). God has worked miracles through the relics of the saints in Scripture. "And he took the mantle of Elijah that fell from him, and smote the waters, and said, Where is the Lord God of Elijah? and when he also had smitten the waters, they parted hither and thither: and Elisha went over" (2 Kings 2:14). Furthermore, when the Prophet Elisha himself died, he was buried in a cave, but then a man was raised from the dead by touching his relics. After his death, the Moabites invaded, and when some men where burying another man in that area, when they saw the Moabite raiders, "they cast the man into the sepulchre of Elisha: and when the man was let down, and touched the bones of Elisha, he revived, and stood up on his feet." (2 Kings 13:20-21). And in the New Testament we read that "God wrought special miracles by the hands of Paul: So that from his body were brought unto the sick handkerchiefs or aprons, and the diseases departed from them, and the evil spirits went out of them" (Acts 19:11-12). "'lest,' so it was said, 'they should abandon the crucified one and begin to worship this man'—this being done at the instigation and urgent entreaty of the Jews, who also watched when we were about to take it from the fire, not knowing that it will be impossible for us either to forsake at any time the Christ who suffered for the salvation of the whole world of those that are saved—suffered though faultless for sinners—nor to worship any other. For Him, being the Son of God, we adore, but the martyrs as disciples and imitators of the Lord we cherish as they deserve for their matchless affection towards their own King and Teacher.... The centurion therefore, seeing the opposition raised on the part of the Jews, set him in the midst and burnt him after their custom. And so we afterwards took up his bones which are more valuable than precious stones and finer than refined gold, and laid them in a suitable place; where the Lord will permit us to gather ourselves together, as we are able, in gladness and joy, and to celebrate the birth-day [i.e. the anniversary] of his martyrdom for the commemoration of those that have already fought in the contest, and for the training and preparation of those that shall do so hereafter" (The Martyrdom of Polycarp 17:2-3; 18:1-3). Question: "Why do we not do the Unction Service on Holy Wednesday?" The common practice among Greeks, Antiochians, and in some other parishes, of doing General Unction on the evening of Holy Wednesday is not an ancient practice. There is no mention of doing this service on that day in the Typikon, or in the Triodion. The Unction service makes no mention of Holy Week, and so stands completely outside of the liturgical cycle of Holy Week. There is a service that is appointed to be done on Holy Wednesday evening and that is the Matins of Holy Thursday, which is what we do in our parish. This service commemorates the institution of the Eucharist, the Mystical Supper, the washing of the feet of the disciples, and the betrayal of Christ by Judas. So this service is not an inconsequential part of Holy Week, but unfortunately, those parishes that do General Unction on Holy Wednesday, rarely do this service. So why is it that this practice originated? There is evidence of doing General Unction in conjunction with Holy Week that is ancient -- though it was never the universal practice. At various times, it has been done on Lazarus Saturday, Holy Saturday, or Holy Thursday. Unction is the sacrament of healing, both of soul and body. If you are seriously ill, you can ask the priest to do an Unction service, so that the parish can pray that you will be healed. Also, if you have a serious spiritual illness, you can do the same. If you read the letters of the saintly Fr. John (Krestiankin), for example, you will find that he often counselled people to do so, and to take the unction oil home, and anoint themselves with it daily. The purpose of doing General Unction in conjunction with Holy Week was to prepare the faithful spiritually for Holy Week. During the period of Turkish occupation, there was a more practical reason for the spread of this practice, and also why it was done on the day prior to the Vesperal Liturgy of Holy Thursday. The Turks made it very difficult for the Church to properly educate its clergy. Consequently, the only educated priests were generally monks, and so only they were usually given a blessing to hear confessions. This led to the unfortunate practice of infrequent communion, because it was not possible for the average laymen to confess to such priests, and during Holy Week, the need for confession was greater than the supply of those priests who could hear them. And so on Holy Wednesday, General Unction was served as a substitute for confession, so that the faithful could receive communion at the Holy Week Liturgies that were to follow. The original practice was not to displace the Matins of Holy Thursday, but rather to precede it. However, if you do the General Unction service fully, it takes about 3 hours, not counting however long it takes to actually anoint the faithful, and so over time the Holy Thursday Matins was general displaced. The reason why the practice developed is understandable, but it is problematic for a couple of reasons. 1. Unction should not be used as a substitute for Confession, under normal circumstances. In fact, in Russian practice, one must have gone to Confession recently in order to receive Unction. The problems created by Turkish occupation were not normal, but there is no reason why the exceptional should become the norm, when the exception is no longer necessary. 2. This has generally encouraged an indifference to the need for regular Confession. For those who have grown up with the practice of doing General Unction on Holy Wednesday, the service is one of the best attended services, and I can understand their reluctance to change it. But be that as it may, this has not been the Russian practice, and we have never done it in our parish. Furthermore, even if I wanted to adopt this practice (which I don't), our bishop would not allow it. In the Russian Orthodox Church Outside of Russia, different bishops have different practices, but generally they do not allow a single priest to serve General Unction by himself. Some bishops only allow General Unction to be served when they are presiding, and they generally require that 6 priest concelebrate the service with them -- the service ideally should have 7 concelebrating priests or bishops (there being 7 Epistle and Gospel readings, and 7 anointings). Our own bishop serves this service once each Lent, when we have our Lenten Clergy retreat, which allows for there to be enough priests to serve it. Archbishop Peter allows priests to serve this service elsewhere in the diocese, without the need for him to preside, but there must be a bare minimum of two priests, and preferably, at least 3. But doing this service instead of Holy Thursday Matins is not the normal practice anywhere in ROCOR that I am aware of. I do think the practice of doing General Unction during Lent as an aid to preparation for Holy Week has value, and we may, in the future, serve it, if at least one other priest is willing to concelebrate it with me. If so, we will probably try to do it during the sixth week of Lent (depending on when Annunciation falls). 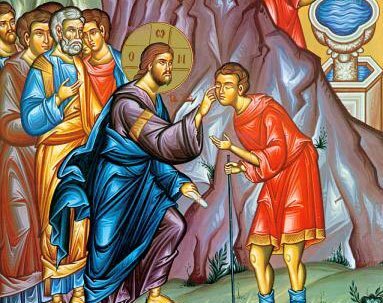 But I cannot imagine failing to serve the Matins of Holy Thursday, and it is unfortunate that so many Orthodox Christians have never seen this service actually served. I would also encourage more of our parishioners to ask for the Unction service when they have a serious physical or spiritual illness (such as an addiction, depression, etc).